Jason Brown leads worship as the South Focus Retreat begins. The South Focus Retreat for Grace Brethren pastors began tonight in Orlando, Fla. Like other Focus Retreats that have been held around the country, it is led by Tom Hocking, moderator of the Fellowship of Grace Brethren Churches (and pastor of the Bellflower, Calif., Brethren Church), and is an opportunity for refreshment and reconnection for pastors. Unlike the others, this is held on a weekend — a Friday night and a Saturday to allow bi-vocational pastors to participate. (Others have been held on weekdays.) 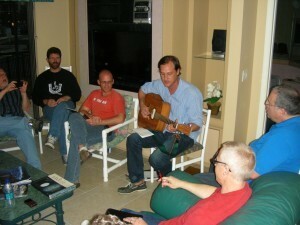 It is also a smaller retreat, with 12 pastors gathered from around Florida. Pray for the men this weekend as they study the Word, listen to God, and fellowship with one another.